The following section aims to tell the story of the development of the Herring Era Museum. We trace the unusual origins of the museum planning committee - how a grassroots organization founded in 1989 led to the formation of an internationally recognized Museum, housing one of the largest collections in Iceland. The information presented is based on the administrative records of the Municipality of Siglufjörður, as well as from my personal first hand experience and knowledge of these issues since 1978. - Örlygur Kristfinnsson, January 2013. At a Town Council meeting in Siglufjörður on 13 March, 1957 five new members were elected with the goal of creating a Heritage Museum. The following members were elected to the Board: Guðbrandur Magnússon, teacher; Hlöðver Sigurðsson, principal: Jón Kjartansson, mayor; Pétur Björnsson, trader; and Sigurður Gunnlaugsson, town secretary and elected Chairman. At this same meeting, it was agreed to submit to the Board a specific location and a budget of 20,000 ISK to establish the museum. In July of the same year Ragnar Ásgeirsson, a consultant from Reykjavík, met with the Board. He recommended that they focus on items and artifacts connected to the fisheries. Around this same time, the collection was begun. During the years 1957 to 1965, the Board held a total of nine meetings before a hiatus of eight years in planning. Relatively little is preserved from this first planning phase of the committee: one registration form was found from 1972 which lists 28 objects that were found and preserved in storage at three locations. Some of the objects found were considered to have little historical value - for example "elliptical shaped box [probably from the 19th century], without base, moldy, useless and disgusting." The collection of these objects was undertaken by the five member Board and registered by Guðbrandur Magnússon on 22 March 1972. 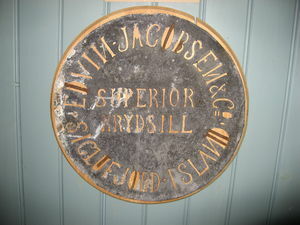 One of the items from the first years of collecting - from Edwin Jacobsen's salting station. The council of Siglufjörður hired Frosti Jóhannsson to explore the possibility of launching the new Museum, and to continue building the collection. Frosti, who was studying to be a folklorist in Sweden, worked diligently to address these issues over the course of three years. 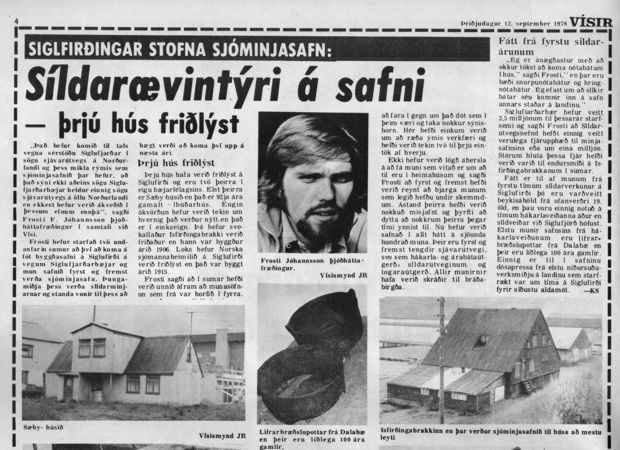 At this stage (1978 - 1980), the Museum Board included Anton Jóhannsson, Guðbrandur Magnússon, Konráð Baldvinsson, Sigurjón Sigtryggsson and Örlygur Kristfinnsson. 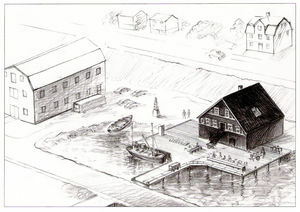 At a meeting on 18 July, 1977 the Board approved the following plans: Preserve three historical buildings, to purchase the old salting station Róaldsbrakki, to provide an office and warehouse space, preserve two Purse-seine boats, to hire Frosti F. Jóhannsson as Project Manager and to document the remaining structures from the herring years. Collecting began that same summer with a primary focus on 'herring monuments', tools, boats and fishing gear. Three houses designated to serve as the Museum were preserved. The old Norwegian Sailors home (1915) was to host the Heritage Museum; Róaldsbrakki (1907), the herring history; and Sæbyshús (1886) preserved as a typical Icelandic home. Frosti laid out ambitious plans for the Herring Museum. A part of his proposal was that it would be one department in a large Maritime Museum of North Iceland, located in Siglufjörður. Frosti spent his last summer here initiating research on the employment history of Siglufjörður and to identify the lots that once held varied corporate giants. When it became clear that the controversial plans for a Heritage Museum in Siglufjörður would not be accomplished without much detailed historical research and also that renovations to the buildings would require significant funding, the interest from the local community waned. Frosti Jóhannsson resigned in 1980. Plans for museum construction gained wide attention. 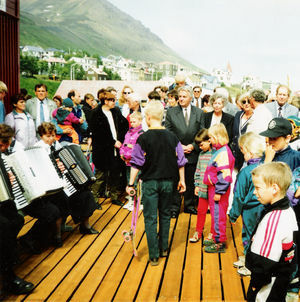 The foundation which Frosti Jóhannsson and the progressive Siglufjörður Town Council had established, remained but little happened over the next decade. Enthusiasts from "out of town" were anticipating the next steps in the development of the Museum's sites and plans. Little was heard from the City Hall between 1985 and 1989 - other than a suggestion to demolish Róaldsbrakki (one of the historical houses! ), to shelve the Museum Board and to bury the collective dream of the museum. In the summer of 1985, a group of enthusiasts undertook the renovations of Róaldsbrakki, painting the walls and exterior of the house. On September 23, 1989, a considerable number of residents came forward and formed a non profit partnership, called FÁUM, for the primary purpose of building a museum. The board were elected: Örlygur Kristfinnsson, Kristrún Halldórsdóttir, Anton Jóhannsson, Hinrik Aðalsteinsson and Regína Guðlaugsdóttir. Substitutes: Birgir Steindórsson, Bragi Magnússon and Guðný Róbertsdóttir. In October, an agreement to take possession of the designated buildings was signed with the Town Council of Siglufjörður. FÁUM now owned Róaldsbrakki, where most collectibles, including three boats, were stored. FÁUM-partners work on new foundations for Róaldsbrakki. The bottom floor of the house is demolished and moved about 40 meters to a new base. 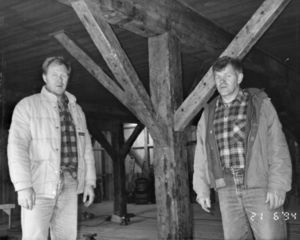 Jón and Erling Co. construct this new foundation. All collectibles are stored and displayed in the temporary museum location of Hafnarhæð. Volunteers show interest in preserving Bein, a former bone-meal factory. 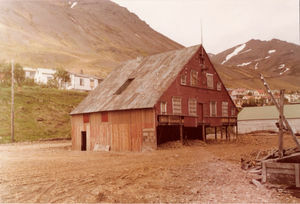 On the 20 May, the birthday of Siglufjörður, FÁUM open an exhibition in the temporary museum location of Hafnarhæð. A larger than expected crowd attend the opening, and Thor Magnússon, Director of the National Museum of Iceland gives a speech. This same day, Örlygur Kristfinnsson, later Museum Director, speaks on television about the main goals of the Museum committee: rebuilding Róaldsbrakki with a deck in front, where salting demonstrations could take place. The new Róaldsbrakki is blown from its foundation and substantially damaged during an August wind storm. Later that same winter, Bein is also blown from its foundations – after many volunteers have contributed significant time renovating both buildings. An overview of the Herring Museum is published and widely distributed. 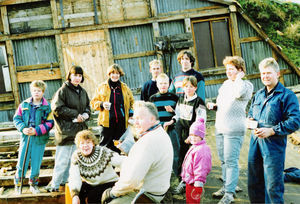 The first 'Herring Adventure' festival is held in Siglurfjörður - this same event continues to this day. Reconstruction of Róaldsbrakki continues with support from the Cultural Heritage Agency of Iceland and various donors. Volunteers work themselves to the "bone" to rip apart the ruins of Bein. Large timbers are salvaged for repairs and new construction. The exhibition at Hafnarhæð is open daily during the summer attracting about 1,700 visitors. Repairs continue on Róaldsbrakki. 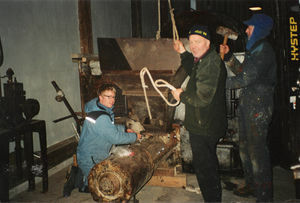 Volunteers travel to Ingólfsfjörður and collect machinery from the old herring factory. Extraordinary efforts are made to retrieve valuable artifacts. Five men spend the summer cleaning the machinery and other museum objects. On July 9th, an official opening ceremony for Róaldsbrakki is held. The first direct financial contributions from the town council of Siglufjörður to accelerate the development of the museum are received. The museum opens with a beautiful exterior renovation and a historical exhibition on the ground floor, along with a new front deck where salting of herring is demonstrated, accompanied by accordion playing. Ólafur G. Einarsson, Minister of Education, officially inaugurates the museum and Thor Magnússon, Director of the National Museum of Iceland gives a speech. In tandem, a small temporary exhibition in the old engine house beside Róaldsbrakki opens. Many visitors are in attendance at the opening festival. FÁUM buys Njarðarskemma, a building north of Róaldsbrakki. 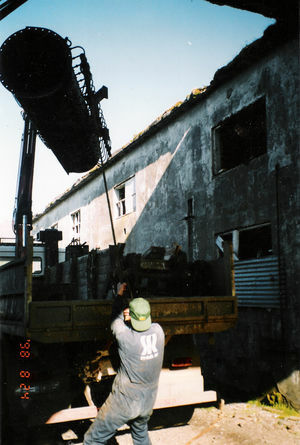 Volunteers collect artifacts from the old herring factory in Hjalteyri. Registered visitors to the museum this summer number 4,250. Róaldsbrakki inaugurated on 9 July 1994. Ongoing repairs to Róaldsbrakki are the focus of this year - with the restoration and exhibition design work on the second floor as the primary goals. This summer regular exhibitions of salting take place: tourists are shown the old practices and daily life of the herring years in a lively and entertaining way. Salting exhibitions continue to be an integral part of the work of the museum and attract a lot of attention and enjoyment. Reconstruction of Róaldsbrakki is complete. A large number of volunteers spent time repainting the building etc. Róaldsbrakki is complete for use as museum building (exhibitions on all three floors). Örlygur Kristfinnsson hired full time as Director. Hafþór Rósmundsson becomes Chairman, and the following people are appointed to the Board: Anton Jóhannsson, Birgir Steindórsson, Guðný Johansen, Hinrik Aðalsteinsson, Regína Guðlaugsdóttir, Sigurður Guðmunðsson, Sveinn Björnsson, Sturlaugur Kristjánsson and Thor Jóhannsson. 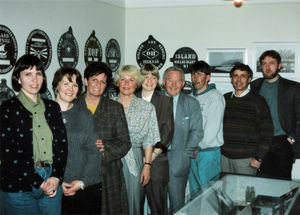 Planning the Boathouse exhibition 1996 - 1997. Drawn by Örlygur Kristfinnsson, Museum Director. A small publication is produced to provide an overview on proposed future development of the museum. 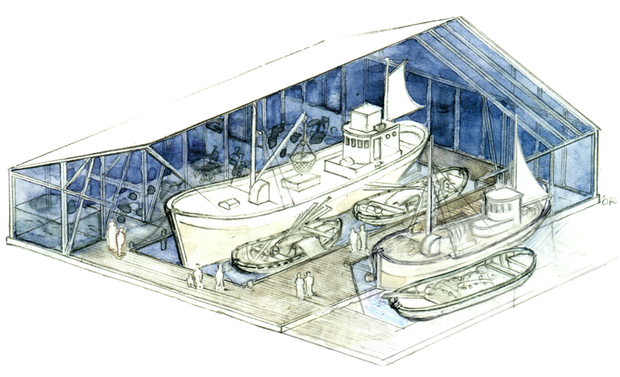 It describes in words and pictures how a new building could house an exhibition of historic boats and fishing gear. The Director works on these plans for many months with the support of the Board. At a meeting with the Minister of Education, Björn Bjarnason, he announces his decision to contribute 10 million ISK to the further development of the museum. The Museum Director spends the autumn constructing drawings for the herring factory exhibition. FÁUM buys Andrésarhús. 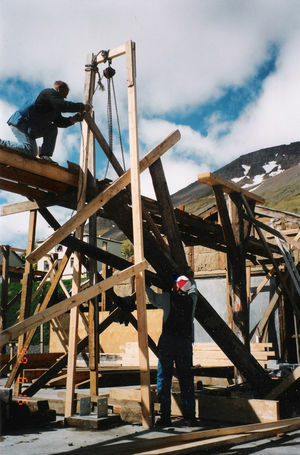 Carpenters work on the foundations for Grána, the herring factory. During a Town Council meeting on Siglufjörður‘s birthday, May 20th, the municipality donates 10 million ISK to the development of the Herring Era Museum. The Museum's first website opens. 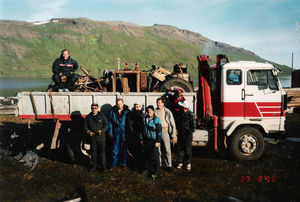 Volunteers travel to Ingólfsfjörður to retrieve more objects from the former herring factory. The Herring Era Museum receives the first award every presented by the Icelandic Innovation Tourist Board. Grána is built – wood salvaged from Bein is put to good use. Another trip to the old factory in Hjalteyri. 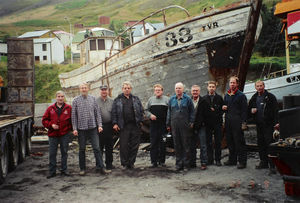 On their 60th anniversary meeting, the Federation of Icelandic Fishing Vessel Owners, approves a 5 million ISK donation towards the construction of the third museum building, the Boathouse. Engineer Þorsteinn Jóhannsson evaluates the most suitable location of the building. Two cruise ships arrive in Siglufjörður for the first time – to pay a special visit to the Herring Museum. At a meeting in the Parliament on June 17, the Museum is awarded honorary recognition by the Republic Museum Foundation. Construction of Grána is complete and folk music concerts held within it for the first time, along with a photo exhibition in the loft. Sigurjón Jóhannsson, stage designer is asked to provide a working model for the Boathouse exhibition. New exhibition proposals, based on earlier drawings by the Museum Director, are approved by the Board. The Museum is awarded the first Icelandic Museum Award. Boathouse planning continues. Árni Páll Jóhannsson, a stage designer, provides consultation on the building's appearance. He presents drawings of a three segment building in line with the appearance of the existing museum buildings. Foundations are laid. Work begins on the installation in Grána. Chris Bogan, a Canadian historian, collaborates with the Museum Director. Additionally, five men are hired temporarily for the work on Grána. Preparation of the Boathouse continues. 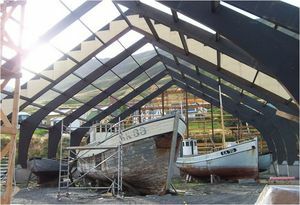 The ship Týr SK 33 is brought from Sauðárkrókur and placed alongside Draupnir EA 70 inside the base of the new, still unbuilt, Boathouse. Installation of the Grána exhibition continues. Boathouse construction begins in the middle of summer. The roof is complete by the end of the year. The factory exhibition in Grána is finished. The Icelandic Museum Council recommends the Herring Era Museum as Iceland's entry for the European Museum Award - the first Icelandic participant in the 25 year history of this competition. Wim van der Weiden, Chairman of the European Museum Forum visits and assesses the museum. The Boathouse is complete and is inaugurated on June 29 by Haakon Magnus, Crown Prince of Norway. A large festival is held in July to commemorate the 100 year history of Icelandic herring industry. The Herring Era Museum is awarded 'Best New Industrial Museum' in Europe by the European Museum Forum. The Museum Director attends the conference ceremony in Athens in May. 15 years of restoration and construction work for the Herring Era Museum are completed. The old Róaldsbrakki has become an elegant building, two large museum buildings constructed and a large collection of "old, ruined stuff" has been turned into a treasure – in what is now the third largest museum in the country. An agreement is signed in August with Þorgerður Katrín Gunnarsdóttir, Minister of Education, for a payment of 40 million ISK to help with the costs of construction work over the years. This allows for coverage of initial expenditures on these large projects. Foreign dignitaries, including Nordic ministers, visit the Museum. Museum buildings are used for various notable concerts and exhibitions, confirming the new position of the Herring Era Museum in the public eye. A private foundation is established with the new name: The Herring Era Museum of Iceland. This marks the end of FÁUM (volunteers) running the museum –now that it has become a larger institution. Repairs to the boats in the Boathouse begin. Repair work on boats continues. The museum buildings are in use for a wide variety of cultural events including the Folk Music Festival and art exhibitions. The Midsummer Night's festival is held to commemorate the 100th anniversary of Róaldsbrakki – a conference about Halldór Laxness Guðsgjafarþula. Ten employees are now on the payroll but only the position of Director at the museum is permanent. 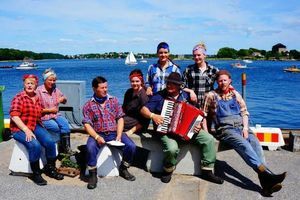 Midsummer Night's festival is held at the Museum for a second time, including a conference and an evening concert - this last in the spirit of an old radio program in which fishermen could call in and request their favorite songs. In August a formal collaboration is established with the Wooden Boatbuilding Conservation Centre in Gratangen, Northern Norway. 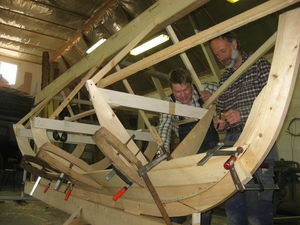 Two men from the Museum travel to Norway and assist with rowboat construction for three weeks. Two new employees are hired: Rósa M. Húnadóttir, folklorist and Skúli Thoroddsen, carpenter. Follow-up projects are undertaken under the supervision of Björn Lillevoll from Gratangen center for conservation of wooden boats. A groundbreaking agreement is made with the Ministry of Education which provides a new role for the Museum and establishes annual contributions from the state. 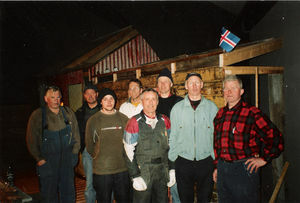 A department is set up within the museum to help locals establish a Ski Museum, with the aim of collecting objects, documentation of history and an exhibition about skiing – given Siglufjörður's rich history of skiing and professional skiers. Repairs to Týr SK, the largest boat in the Boat House, are complete. Now on display, the boat itself is open and accessible to visitors. Anna Snorradóttir donates the former residence of her parents, Hlíðarhús, which dates back to 1898, to the Museum. With improved transportation via the Héðinsfjörður tunnel, attendance to the museum increases exponentially: from 11,800 to 19,300 visitors - an increase of 60%. Historian Anita Elefsen is appointed Curator of the Museum. Carpenter Skúli Thoroddsen retires. Museum staff work on the systematic research of herring history, culture, and the registration of objects and artifacts into a historical database for Icelandic museums. On behalf of the museum, the book Story from a Herring Fjord is published and illustrated with watercolors by the Museum Director. Through it, we intend to educate young people about the herring era. Registering - Rósa and all the "díxlar"
In March, the municipality of Fjallabyggð hands over the old Slipway to the Museum. The Museum has long desired to preserve this building, one of the oldest small boat building workshops in the country. An exhibition of 200 years history of wooden boat building and repair in Siglurfjörður is designed and opens in the Old Slipway. An exhibition covering the 100-year history of fish-meal and fish-oil industry in the country opens on Midsummer Night. Museum staff creates a fascinating exhibition of 15 displays for Grána, intended as a traveling exhibit throughout the country in the coming years. A seminar on the history and status of the fish-meal and fish-oil industry today is held. Considerable development takes place in the Museum area where walking piers are built in between all three museum buildings. 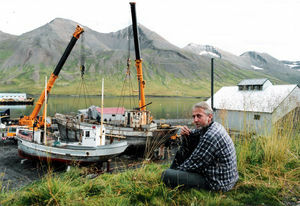 Boatbuilder Jón Ragnar Daðason is hired. Among his projects are ongoing construction of the walking piers in the museum area. When the walking piers are complete, appropriate lighting is installed. Jón Ragnar also spends much time in the Old Slipway to repair an old boat. Preparations begin for a new museum building, the Salt House, which will rise between Grána and Róaldsbrakki. A Salting Demonstration is requested by the Coast Cultural Festival in Karlskrona, Sweden. A group of ten 'herring girls', workers and an accordion player travel to Sweden to represent the Museum and participate in the Festival. 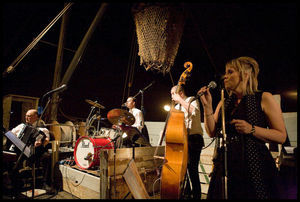 The seventh Midsummer Night Festival is held at the Herring Era Museum and is very successful. Attendance at the museum reaches a record high of 19,845 visitors, with as many as 46% of attendees coming from foreign countries.